Seven of us braved a fairly dark and chilly morning to meet up at East Hunsbury for Tim’s 52-mile steady ride around Northampton. The half-way point saw us getting stuck into cake and coffee and sausage rolls (possibly in that order) at the cafe in Brixworth Country Park having swept round the south and west of the county through Kislingbury, East Haddon and Spratton climbing what felt like most of the Northants cols on route.before Brixworth. The second stage included Holcot and Earls Barton before crossing the river and climbing up the day’s last mountain to the peak at Castle Ashby where we stopped for more coffee and cake. We had dropped Phil L off by this stage but picked up another, Elspeth, at the Castle so we were still seven and then we lost Geoff who was nearer home than he would be at any other time and so we were six. We six nipped back towards East Hunsbury via Denton and Preston Deanery at which point three more of us set off homewards and the remaining three – well, who knows – I was safely tucked up at home with coffee and a well deserved couple of slices of cake. I heard later that the final three made it back to the start point safely, so a good day out was had by all. A well devised route with thanks to Tim! Four riders undeterred by the prospect of a testing loop through Naseby joined me on an overcast morning at East Hunsbury. Alex and Andrew joined regulars Brian and Ian M to make the foursome. All of us were unaware of the drama to unfold later that afternoon. Upton and St Crispin’s provided the urban backdrop to the start of the ride before reaching familiar ground through Harlestone and the Bramptons. The climb through Church Brampton was the first real test for the group but we all pretty much arrived at the summit in unison. Onwards at a leisurely pace we passed Sedgebrook Hall before reaching the A508 followed by another steep climb into Brixworth Country Park for a well-earned tea stop. Milton was already there in the Spring sunshine and we duly joined him whilst one or two of the group looked in at Pitsford Cycles adjacent to the cafe. On the move again, now six strong, we blazed down the steep gradient at the back of Brixworth where a slight breeze kept our speed down just a little. It wasn’t long before we were in low gears again though as we grinded up the long haul to Spratton which splintered the group a bit. Regrouping at the top we headed for another fast descent skirting Teeton before hitting another rise on the way to Guilsborough. The roads then flattened out for a while and we all enjoyed the scenic views as we cruised along the quiet country lanes in the now glorious sunshine. Once through Guilsborough we turned for Cold Ashby on more scenic roads and another fast downhill to enjoy. Andrew headed the group and soon reported that he had hit a pothole that he was unable to see. The rest of us avoided it. A pinch puncture was the inevitable result and we all came to a stop although there are worse places to have a puncture than our picturesque location and nobody was in any rush to carry on! The change of inner tube didn’t go as straightforwardly as it should have but with one or two tubes and a number of pumps to hand we finally got on our way again. Puncture repair? Or a chance for a rest in the sunshine? Our ride leader (left) demonstrates his ability with a pump after Andrew (right) suffered after hitting a pothole! We reached Cold Ashby and the road to Naseby. Or so we thought! As we reached the main A road we spotted a large sign pointing us back a mile or two for Naseby and the battle site. Having ridden the route before, I was sure we were going the right way despite the sign but, convinced by the group that I had taken a wrong turn, we headed back to the last junction and beyond only to see another sign to Naseby pointing in the opposite direction! We headed back the way we had gone initially and Andrew realised that the large sign on the crossing had indeed been hit by something and was spinning freely. He dismounted and pointed it in the right direction. Puzzle solved! A couple of miles later we arrived in Naseby at the Old Vicarage right opposite All Saints Church. Eleanor had already arrived and was relaxing in the lovely grounds. We all sat down and enjoyed lunch together in the open air. Andrew decided after lunch to make a beeline for home on a direct route whilst Eleanor joined us for the planned ride back. Through Cottesbrooke we avoided riders and runners on a local triathlon event and made our way through lovely surroundings and onto the gated road for Brixworth. The inevitable climb back was next before six became one as everyone except me headed for Holcot and their own way home! I pushed on through one or two more climbs and continued on the route back home. I called it a day at Hunsbury Meadows and avoided the last climb of the day back to the start. A dramatic day – what with one thing and another – with plenty of climbs and impressive descending from all the riders. From East Hunsbury we’ll head towards the urban areas of Upton and St Crispin’s before winding our way through Harlestone and the Bramptons. With one or two climbs behind us, we’ll soon arrive at Brixworth Country Park for our first well-earned pit stop at the Willow Tree Café with the Pitsford Cycles Shop. The loop continues through Haselbech and the Cottesbrooke estate before climbing back into Brixworth again. From there we’ll pretty much retrace our steps back to Harlestone before turning for a short stretch along the Roman Road. Another fast descent through Harpole brings us to Pineham with its wide cycle paths over to Hunsbury Meadows leaving us with just a mile or so back to the start. It’s a bit of a climber this one. Last time out Brian rode with me and clocked it at around 3000ft of climbing. But with pit stops along the way, you should be able to fuel yourself round without too many problems. Phil is on 07927 377191. 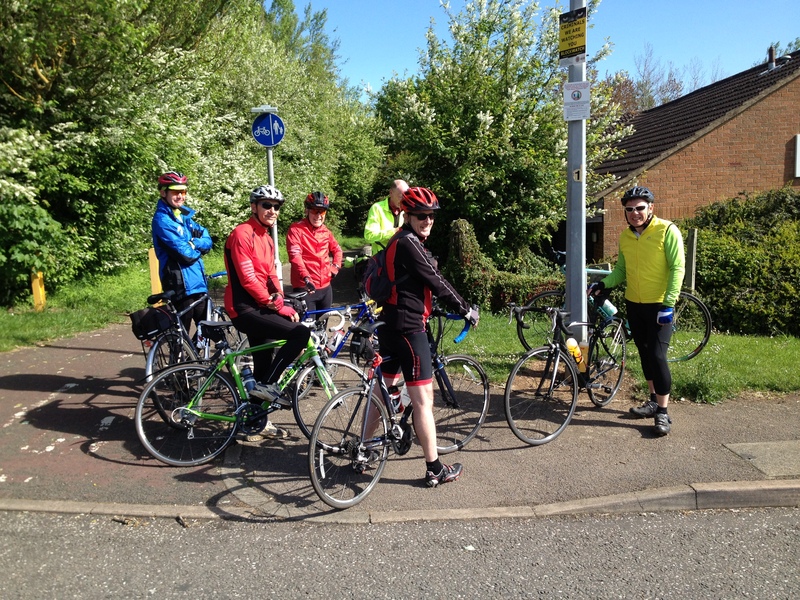 A sunny but windy day greeted the seven riders at East Hunsbury for this second club ride to Draycote Water this year. They included new boys Norman and Geoff as well as recent newcomer Tim. Once over the cycle paths at Pineham, which allowed everyone to warm up, we hit the road proper at Harpole culminating in the short sharp climb onto the Roman Road. The next few miles around Harlestone allowed all the riders to recover before the long haul up to the top of Brington Hill where we saw other cyclists reaching the top just ahead of us. The journey through the village of Whilton was pleasant and the fast decent into Whilton Locks even better although we did seem to have no choice but to pedal downhill due to the force of the wind. The sun seemed to have long gone at this point too. The gated roads from Norton beckoned and apart from the first corner of gravel posed no problems for the group and were virtually traffic-free. We pressed on towards Welton at a steady pace and onto Barby before an impromptu stop outside Barby Nurseries for everyone to take on whatever fuels they needed. On the move again we soon hit decent road conditions over the border into Warwickshire and another long haul towards the main road into town. Cycle paths provided much welcome protection from the busy road into Dunchurch before the last mile or two on the A426 into Draycote Water. 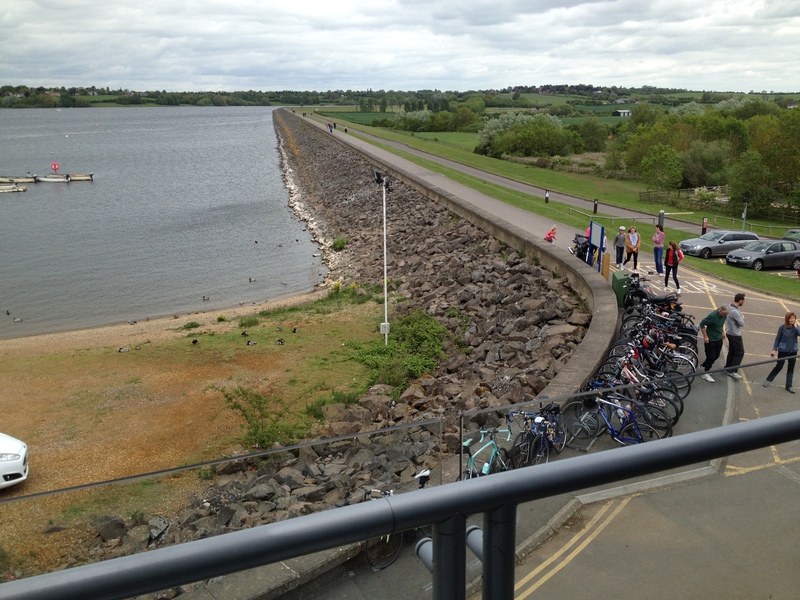 All but one of us chose the much talked about Draycote scones – some riders even suggesting they could eat two! At this point Geoff decided that he would make his own way back home and so the six of us set off on the return journey. The lane through Grandborough was welcomed by the group as new tarmac seemed to have been laid for a good couple of miles. Willoughby was then next en route where we slowed to admire some fantastic classic cars assembled by the side of the road. We cruised through Braunston before re-joining the route we had come in on just outside Welton. The gated roads on the way back provided one of the biggest climbs of the day with a two-tier climb before eventually reaching Norton again. A byway was the next part of the ride and proved interesting in a number of ways. Two fast descents with plenty of gravel at the base of each provided a hair raising experience for us but we all escaped unscathed. The surface then became more off road than road as we slewed and slid our way out the other side and again nobody came unstuck. Back on solid ground we skirted around Brockhall and onto Flore with another climb or two to keep things interesting. The pace then gathered somewhat through Nether Heyford and Bugbrooke but everyone regrouped towards Rothersthorpe for the final push home. With nobody opting to go their own way all six riders returned to the start but not before climbing “Mount Tesco” – a great achievement with almost 60 miles in our legs. Saturday morning, six of us gathered in the rapidly-clearing mist in East Hunsbury for this brisk ride out to Whilton Locks. Two Brians and two Phils – an usual mix for our group. PhilJ had obviously been doing his homework because once clear of Banbury Lane, I don’t think we hit an actual road again until we were nearing Harlestone Firs. Cycle path all the way (in fact, I wouldn’t be surprised if part of that route gets used for a leisure ride next year, it was so pleasant). While the mist had cleared at ground level, the cloud base was still below the top of the lift tower as we left town, when it also started raining, albeit only gently. It did seem to keep the traffic at bay on the Roman road out to Whilton though; it was very quiet for a Saturday.After meeting up with John Cutler at Whilton, the return leg promised to be a little easier on the navigation. It proved to be quite hard on tyres, however, one Phil complaining of a flat at the top the hill out of Whilton, the other Phil about 10 yards later. Top tip of the day: to avoid p*nct*res, don’t be called Phil. (One of those p*nct*res later turned out to be the result of a broken spoke so not the fault of the rain washing grit into the road). The Roman road passed, as you might expect, a little quicker on the way back, being downhill and everything, although one of us did nearly come a cropper on the way through Harpole when a kindly motorist flung their door open without checking for traffic. (If you were that motorist, it pays to check… If you missed a group of highly-visible cyclists (and we were), you’d easily have missed a car and now be looking for your driver’s door somewhere down the road …). Fortunately, we were keeping our distance. Without further incident, we returned from whence we came via the newly-christened “Mount Tesco”*, also known as “the Towcester Road”, completing nearly 30 miles of reasonably brisk riding. Next time, Phil’s promised to take us to Draycote Water. I’m looking forward to that now. * NB: Other retailer-based naming conventions are available.